The Bear Will Not Quit: Will This Year Be Any Different? The numbers say no. But there are two things that are different about this team than the 2005, 2006, and 2007 teams. First, they are still a bit of an unknown quantity on offense. The last three teams were pretty quantifiable offensively. Though the 2006 offense was explosive at times, you pretty much knew what you were going to get every week. The same cannot be said of this team. The receivers seem to be getting better every week and are talented enough to make big plays. Best and Vereen frequently seem an inch away from ripping off huge runs on any given play. And though Longshore is getting the start, if Riley comes in, he gives you that sense that he's on the precipice of that elusive "great" game. Second, this is a playmaking, game changing defense, something Tedford has never had at Cal. The 2004 defense was great against the run, very disciplined, very tough. But they were a contain defense, not a playmaking defense. And 2006 had a lot of playmakers, but they were not able to pressure passer the way this defense can, and were not nearly as effective at ballhawking in zone coverage. This team seems capable of turning the momentum and tide of the game at any moment, by a sack, an INT, a safety, or a big hit. These two things make me think the door remains open for Cal to defy the odds and play outside the statistical margins they've drawn for themselves over the course of 8 very different games. But make no mistake, the numbers favor USC pretty solidly, no matter how you look at it. While USC is averaging over 40 points a game, if you take away the blowouts over the Washington schools, it's more like 27 per game in conference play. But like every USC offense under Carroll, it can and does strike quickly using its speed in the passing game. Sanchez has 22 TDs this year, and that is with Carroll calling off the dogs early in a number of blowouts. Yikes. USC fans love to complain about Sarkisian's offense being stagnant at times, and not running the ball enough, but I personally think he's done a nice job with a first year QB, a new TE, and 2 out of 3 new WRs in the first rotation. Granted all these guys are great athletes, but plenty of coaches would do worse with this young talent. 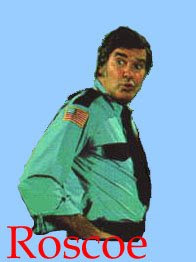 Mack "Roscoe P. Coltrane" Brown anyone? is chase the Duke boys. Hook 'em. In terms of style, USC is a pro-style, balanced offense, not too different from Cal's. They are not much of a deceptive offense, though like Tedford, Sarkisian likes to set up back breaking plays using tendencies. They make good use of the TE and FB to create matchup problems for linebackers. A favorite play of Sarkisian's is to run the FB Havili (who has tailback-type speed) on a wheel route or a quick bench route to the sideline, after the WR has cleared out the pass coverage. In terms of the QB, they've moved Sanchez around more to take advantage of his mobility, rolling him out and moving the pocket a bit. He is a very accurate passer, with a very strong arm, and good command of the offense. Talent-wise and numbers-wise, he is the best in the conference. Sarkisian also does a good job with rub routes, which is one reason there are so many highlights of USC WRs running free with no one around them (frankly I think USC gets away with more picks downfield than any other Pac 10 team). The other reason is because their receivers are pretty fast. This is the matchup that scares me the most. While Cal's done a nice job this year in pass coverage in terms of INTs, they remain susceptible to fast receivers going deep through the middle of the field. Whether it was Mike Thomas beating Thompson on a post route, Mark Dell torching the Cal secondary for 202 yards, or Carpenter hitting a receiver for 6 over the middle in man free zone, Cal can be had by quick receivers, especially in the seams. Damian Williams and Ronald Johnson are as sudden and fast as any receiver Cal will have faced this year. Damian Williams in particular might be the toughest cover in the conference. And Patrick Turner is the big Mike Williams-type receiver they use on slants for possession plays. Sarkisian does a nice job with route combinations, and Sanchez has excellent timing on his passes. Cal's zone scheme is very sound, and the players have improved every week at route recognition and playing the ball. Syd and Hagan are pretty good man defenders in short to mid-range, but don't have the elite speed to stick with Williams and Johnson on longer routes (if Sanchez gets enough time). Ezeff is an average man defender, but is a smart zone player. Cattouse has been used a lot on third down as a FS and has played well (except on the TD vs ASU), but he has a concussion, so it may be Johnson, who is definitely better at run than pass. For all of these reasons, I expect a lot of zone. Edge: USC. I think USC is going make some plays in the passing game in man to man coverage, not many, but a few. They have great speed at receiver, more than the last two years, and I think they will create individual matchup problems. The one caveat is if Sanchez does not get time to throw, it may negate this somewhat. Sanchez has a bit of the Hollywood syndrome, in that he likes to make big plays rather than small ones. He is very talented, and seems almost to expect to throw TDs early and often (in fairness, he has pretty much done that in every game). Because of this, he has a propensity to make throws into narrow windows at times. He has the ability to do it, but that is also the reason he threw 4 INTs in one game earlier this season. Cal's secondary is clearly looking for the INT on every passing play. You can bet they have watched film and will be opportunistic about turnovers all game. If Sanchez gets greedy, especially early on, things could get interesting. Edge: Push (which is technically an edge for Cal). I think Sanchez has heard all week about Cal's secondary, and I think the coaches have made it clear that they cannot afford to turn it over against a good team like Cal. I think he will look, but will not force the ball when Cal is in zone, because Cal will be in position most of the game. There will be some big plays, but I foresee them more on single coverage than zone. on the planet. I knew I liked this guy. Lachaim to you Mr. Mays. Carroll's mantra against balanced teams like Cal is to take away the deep ball and make you dink and dunk your way down the field. His theory is eventually you are going to make a mistake or get in third and long, and then USC is going to send the jailbreak blitz. 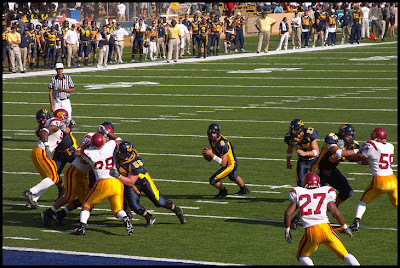 Every time Cal has tried to go deep on USC (other than one decently long pass to Lyman in 2004), it has been picked, incomplete, or knocked down. But that is also why Cal has been able to run the ball decently against USC over the years. They don't gamble a ton against the run the way we've seen teams play Cal this year. They do blitz very aggressively, especially on third down, but you are not going to see them routinely bringing up 8 in the box unless Cal's formation dictates it. Typically, USC will play zone, and have 1 or 2 safeties back. The linebackers are the strength of this defense. Though USC has always has talent, this unit flows to the ball as fast and decisively as any I've seen under Carroll. It is a good thing too, because USC's DTs are probably as weak as they've been under Carroll. These LBs also have great size and are sure tacklers. Cal's o-line has had trouble all year with athletic linebackers beating them to the point of attack, starting with the Maryland game. They have been improving somewhat, but now with injuries to LG, RG, and RT, the improvement seems to have leveled off. Edge: USC in slower developing, lateral run plays. Cal has struggled on sweeps and zone running plays against fast linebackers and safeties, and this game shouldn't be any different. On more straight ahead or power-blocking schemes though, USC's speed at linebacker will be neutralized somewhat, and Cal should have a bit of an advantage over USC's weaker d-line. Starting DT Spicer is out, and backup Tupou is a sophomore. Moala is a solid DT but got pushed around by Oregon State. Moore and Griffen are very good pass rushers, but also do not dominate against the run. Cal's o-line has always had good success against SC running the ball, and though Cal is also green up front, with these injuries to SC, there should still be some room to run up front. Edge: Cal in the power run and man blocking scheme. Cal has a chance to win some of these one-on-one matchups tomorrow. This is the other key matchup of the game. Particularly with Longshore, Cal has got to resist the urge to go over the top. USC has made Cal pay every time for these passes. Longshore has so much faith in the pass plays called, that he throws to spots on the field, expecting guys to be there, often before they even break. While this is the objective of the offense, and the way it is supposed to run, it requires impeccable play by the receivers. If they're not there, the defender jumps the route, or the throw's an inch off, it often gets picked by good defenses like USC's. While Riley is definitely more of a slow-read, wait-till-he's-open QB (which needs to improve eventually), that is unquestionably the way you must play against USC with this young group of receivers Cal has. If Riley can buy some time with his feet, his arm strength and need to wait until a guy is open can actually allow him to have some success downfield. But otherwise, both QBs need to keep things short, quick, and in rhythm. Edge: Push. I really can't call this one because you just don't know which QB is going to show up. Good Nate, bad Nate, good Riley, bad Riley. But the average of all four has been pretty solid, if unspectacular play. Kicking has been huge in most of these games - it won it for us and lost it for SC 2003, and it killed us in 2004. Huge pressure game for Tavecchio, but he seems just wacky enough to be up to it. 2. Punting and field position. Field position hurt us last year, with SC starting at the 50 a couple times. Against an explosive offense, Cal has to keep USC pinned and make them drive. They did this for 3 quarters in 2006 and the score was 9-9 going into the 4th.